MODERN MACHINE SHOP 81 BETTER PRODUCTION CAD/CAM have been challenging before using Esprit, says Ryan Steele, owner and general manager. "We would have been manually programming a lot of the drilling, hole locations, tap cycles and face milling," he says. After working out some of the more complex geometries on paper, they would have plugged that information into the old CAM software, which would be used as a basic G-code generator. Then they would have copied and pasted the G code into the main program or run it as a com- pletely separate program. 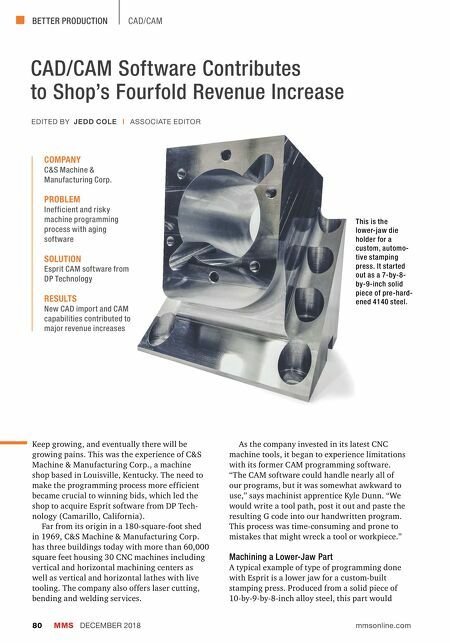 "Our ability to machine the various blended radii and complex geometries would have been heavily reliant on tooling, given the limitations of our software," Mr. Steele says. This process made it extremely difficult to compete on pricing. It also increased the chance of scrapped parts due to keystroke errors and made for longer lead times. Finally, retention of programs was a nightmare, Mr. Steele says. The company essentially started from scratch each time they made the part. Esprit changed everything. For the lower-jaw part, the customer provided a SolidWorks solid model of the part geometry, and the programmer imported the model into Esprit. (This import ability was a big draw for C&S.) The programmer then created a block around the part to define the workpiece from which the part is machined. He began the programming process by choosing from a tooling library that he had created in the past that includes ballnose end mills, square end mills, drills, taps and more. The library ensures that programming and simulation match the dimensions of the actual tooling (including stick-outs, tool numbers, number of flutes and other consider- ations) to ensure accurate collision detection. He then used Esprit's automatic feature recognition capability to restore the intelligence of the part geometry by organizing it into features such as holes, bosses and pockets. He selected many of these features for use in creating tool paths. The programmer created tool paths for the basic outline of the part by chaining edges and line segments to create a few larger surfaces covering the exterior of the part. He then selected these surfaces one at a time and defined contouring operations to pro- duce them. 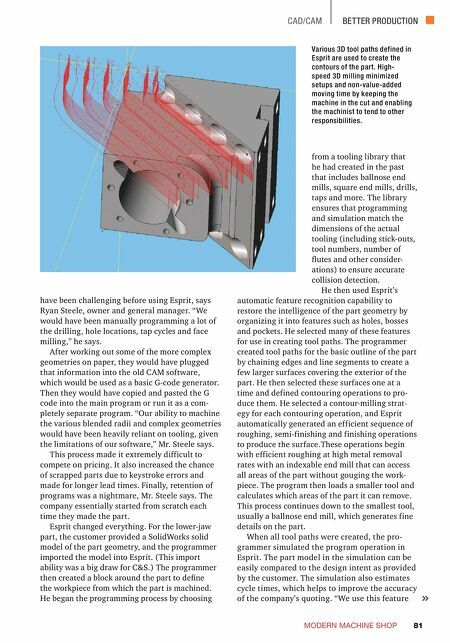 He selected a contour-milling strat- egy for each contouring operation, and Esprit automatically generated an efficient sequence of roughing, semi-finishing and finishing operations to produce the surface.These operations begin with efficient roughing at high metal removal rates with an indexable end mill that can access all areas of the part without gouging the work- piece. The program then loads a smaller tool and calculates which areas of the part it can remove. This process continues down to the smallest tool, usually a ballnose end mill, which generates fine details on the part. When all tool paths were created, the pro- grammer simulated the program operation in Esprit. The part model in the simulation can be easily compared to the design intent as provided by the customer. The simulation also estimates cycle times, which helps to improve the accuracy of the company's quoting. "We use this feature Various 3D tool paths defined in Esprit are used to create the contours of the part. High- speed 3D milling minimized setups and non-value-added moving time by keeping the machine in the cut and enabling the machinist to tend to other responsibilities.